A few months ago I wrote my first review on incompletegeek.co.uk regarding my purchase of the epic Cheerson CX-10 and I figured it is about time to give you all an update as to how it is doing. EDIT: The Cheerson CX-10 is currently available from Banggood’s EU warehouse for just £10.81 with free 2nd class Royal Mail delivery! I’m pleased to say it is still flying brilliantly although a large crash outdoors did require a replacement motor. The Cheerson CX-10 is designed to come apart pretty easily although it is fiddly work and I cracked the top cover trying to separate it from the bottom. Four screws need to be removed, all the props have to come off and a catch from the bottom shell needs to be gently pushed aside in order to allow the top cover to slide off the motors. It was easy to remove the PCB from the bottom shell with the motors, desolder the busted motor (bent shaft) and replace it with the new one. I won’t post pictures of the fix as there are already some great videos on YouTube showing how the process for those who like Step by Step instructions (including me!). I used my new 60W soldering iron that I picked up in the Banggood snap up deals. The 907 Constant Temperature Electric Soldering Iron, as it is creatively titled, is perfect for working on these sorts of delicate RC electronics without melting any thin plastic in the vicinity of the tip. I highly recommend picking one up for under £10. If you pick up genuine replacement motors the wires are colour coded to help you out as, like all these quads, there are two clockwise (CW) and two counter-clockwise (CCW) motors/props. I got mine from Banggood because I wanted to be sure they were originals and luckily they were available from the retailers EU warehouse. I paid a slight premium over ordering from the China International Warehouse but I wanted them quickly and it was worth it when they arrived three working days later. Using a prop guard! I bought the replacement prop pack here (photo below) that came with 3 full sets of propellers and 3 prop guards. Not sure why you’d need more than one guard as so far it has taken all the punishment I could throw at it but I guess it means you can colour code to your Cheerson CX-10 better if that’s important to you. The props are also really well made and have no manufacturing defects such as flashing. They also fit brilliantly on to the motor shafts whereas the 3 leaf clover propellers had been a pain to get on and off these slid in with just enough force to give you confidence that it won’t come off unless you want it too. I hope you’ve enjoyed my brief round-up and if you haven’t already bought a Cheerson CX-10 pick one up now or ask for one in your stocking. Even better, buy your kid one and nick it under the pretence of teaching him/her to fly it. 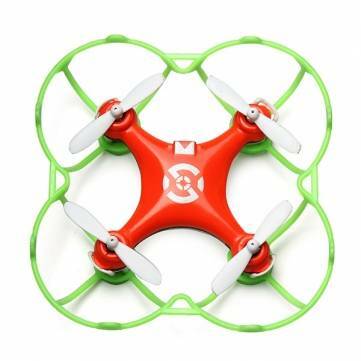 There are a few new Cheerson CX-10 models with designations such as A (headless mode) and C (camera), neither of these are necessary additions to a nano quadcopter such as this and bump the weight up as well as the price. Stick to the original and you can’t go wrong, it is a fun and durable toy that I can’t recommend highly enough! Edit 2: Just stumbled across this which looks like it could be great for protecting the nano quad and flying at night: Protection Wheels w/ 4 Pairs Propellers – If you buy this I’d be interested to know how you get on with it. Is it too heavy? Are the glow in the dark blades bright enough? Please let me know in the comments section below.